This new law is “a clear warning to abusers”. Scotland’s long-awaited Domestic Abuse law came into effect on 1 April 2019. And it means that forms of psychological and emotional violence are – at last – to be a crime in Scotland. It means that a person who engages in a pattern of abusive behaviour toward a partner or ex-partner can be prosecuted and punished by the law. A key aspect is that it will cover a range of behaviours such as psychological and emotional abuse; this includes what is commonly known as ‘coercive control’. Previously, the criminal law focused on physical violence; however, the changes now make coercive control a criminal offence. And depending on how serious the offences are, the perpetrator can get a sentence of between 12 months and 14 years in prison and/or a fine. A campaign to boost public awareness of the new rules and underlying problems will now get under way. Assistant Chief Constable Gillian MacDonald, crime and protection lead for Police Scotland, said all ranks within the force, as well as its civilian staff, have undergone specialist training to prepare for the change. She said: “This new offence is groundbreaking. For the first time, it will allow us to investigate and report the full circumstances of an abusive relationship. “In preparation for the change in law our officers and staff have received further training on the dynamics of power and control in abusive relationships to help recognise the signs, identify investigative opportunities and to tackle the myths and misconceptions of abuse that still exist. 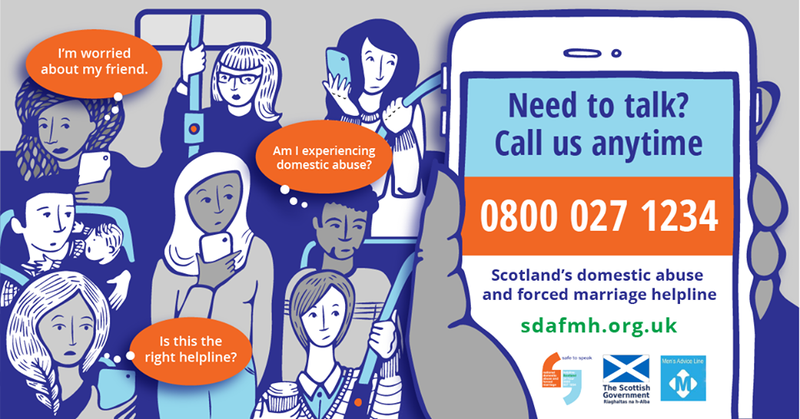 If you feel scared of your partner or if you are worried about someone you know, you can call Scotland’s 24-hour Domestic Abuse and Forced Marriage Helpline on 0800 027 1234 or visit sdafmh.org.uk for help and advice. If you or someone you know feels threatened, call the police on 999.